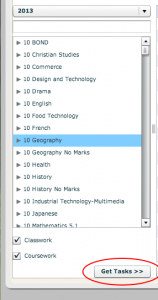 This tutorial demonstrates how to create tasks in edumate containing subsections with individual marks. This allows for linking parts of a task to separate criteria so that sections accurately reflect what they are testing, where as in a simple task the overall mark will weight all criteria linked to that task equally. Currently the drawback of this is that 1 subsection can only be linked to 1 criteria. 1. 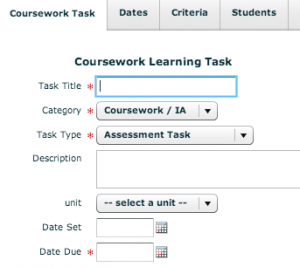 In Edumate click on ‘Learning’, then ‘Results and Reports’, then ‘Learning Tasks’. 2. 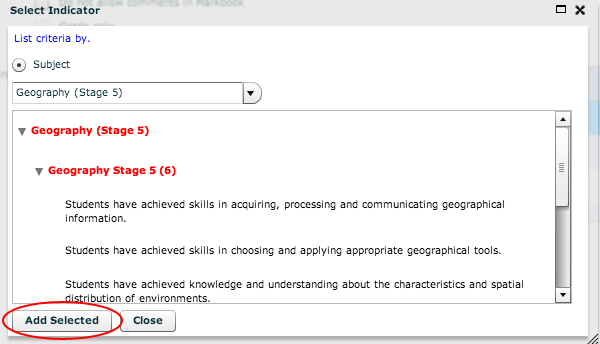 Choose the course that you wish to create the task for from the column on the left. Then click on ‘Get Tasks’ (circled in red below). 3. Either click on the name of an existing task if you want to edit one, or click on ‘new coursework’ to create a new task. 4. As usual, make sure to fill in the ‘Task Title’ and the due date for the task (which will affect which reporting period it falls into). 5. Scroll down to the blue and white grid titled ‘Mark Workings’. Click on the ‘add’ button (circled in red below) once for each subsection that is needed. 6. 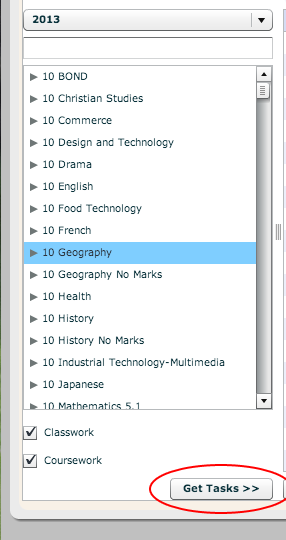 A subsection will appear in this grid each time you press add. Edit the Name in the mark out of by clicking on those fields (circled in red below). To add criteria for the subsection, click on the corresponding edit button (circled in orange below). If you need to delete a subsection, simply click on the heading of that subsection and click the ‘Del’ button (circled in green below). 7. 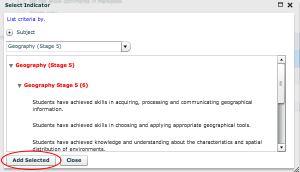 When you click ‘Edit’ above to add criteria, you will see all the criteria available to that course (you might need to click the little triangle to the left of the name in red to expand the options below it). Click on the criteria you want to connect and click the ‘Add Selected’ button (circled in red below). 8. Don’t forget to scroll right to the bottom of the task creation page to assign a Task Weighting to the task if necessary. 9. Click on the ‘Save’ button to save your changes.